Prince Chichibu Memorial Rugby Stadium (Chichibunomiya) is located close to Gaienmae Station on the Tokyo Metro Ginza line. The stadium is not too long a walk from several other stations, but Gaienmae is the closest and is the only station in the heart of Tokyo where it is routine to see rugby posters, decorations, and advertisements. The stretch from Exit 3 of Gaienmae Station to the gate of Chichibunomiya is the spot where you will find pre-match atmosphere. Along the street you will see food and drink stalls selling plastic packs of yakisoba, takoyaki, edamame, and other Japanese dishes. Prices run from around 300 to 600 yen. As there is also no issue with bringing your own food and beverages into the stadium, many people grab beer or other drinks at the convenience store near the entrance. Staff will check your bag on the way in, but will let you bring in whatever food or drink you like. 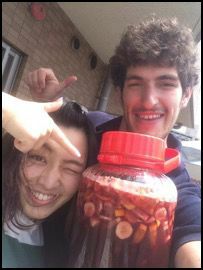 A friend once even brought in a large drum of sangria. Chichibunomiya has an open area as you approach the stadium. Inside the main gate at the entrance is not a ticket-required area. On game days this area has tents set up around the perimeter where you can buy or pick up tickets and merchandise, receive giveaways from sponsors, or get any products included with your ticket purchase (more on this later). The area is quite crowded but is a good meeting spot if you need to find friends before heading into the stadium. Injured or reserve players and sometimes national team or Top League players regularly mill about in this area, which is an added bonus for fans. 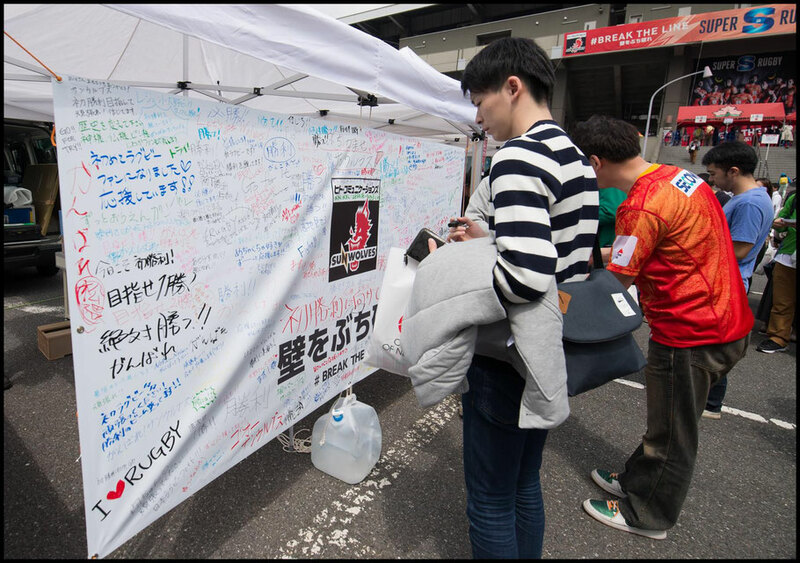 Located on the stretch between Gaienmae Station and the stadium you can find a Canterbury of New Zealand shop that stocks a selection of Sunwolves merchandise. The prices are generally quite high, but the quality of the gear is good. Be careful with sizing, as it is not the same as Canterbury uses in other countries. If you normally wear a large you may find yourself buying a size 3L, which is actually one size up from an XL. 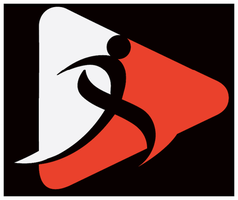 The Sunwolves range includes jerseys, training shirts, hoodies, jackets, shorts and pants, as well as accessories like hats, backpacks, towels, and keychains. If the jerseys are too expensive for you at over 10,000 yen there is a simplified replica version that goes for about 7,000. It is thinner and does not feature some details such as official sponsor logos. It is also possible to buy merchandise at tables set up in the concourse of the stadium. Make sure you are at a table listing prices, whether inside or outside of the stadium, as some of the tables are actually just handing out merchandise that comes with special tickets. 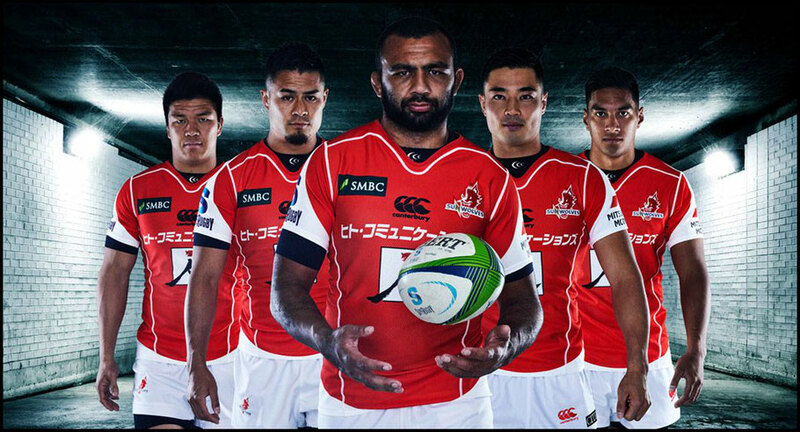 This year Sunwolves have unveiled a third jersey for the first time. It is an interesting sartorial choice to say the least. The ‘Aoyama Red Okami (Wolf)’ jersey designed by Jotaro Saito adds a waterfall motif to their existing red ‘Sun’ and white ‘Moon’ shirts. 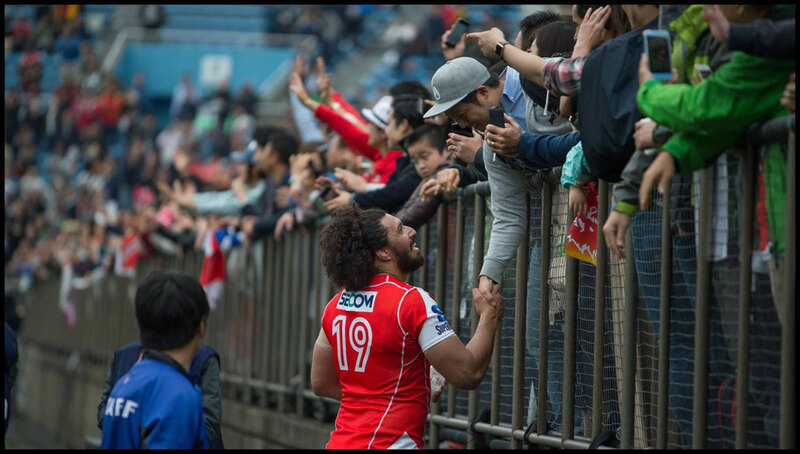 The Aoyama Red jersey was worn for the first time in the March 3rd game against the Rebels. Once inside the stadium proper, food and beverages are available. Prices are pretty reasonable compared to stadia in many parts of the world. A beer will usually set you back about 700 yen with chicken and fries costing around 500 yen. Many people do choose to bring their own food, so there is no need to be shy. If you are early enough that warm-ups are still taking place, I suggest heading to the south side of the field. A platform there makes for a good spot to see some of the visiting team’s players in close range. Fans often stop by here to take pictures. You may get ushered along after a few minutes or you might go undisturbed while taking in the speed and power of professional rugby players up close. The seats in the stadium are not the most comfortable so many fans bring cushions. The noisiest area to sit is in the north end “Party Zone”, where you may be subject to drumming, the greatest force of the stadium’s PA system, and people howling like wolves. This year Sunwolves have selected “Freak Out” by the group ‘Man on a Mission’ as their anthem. The group is known for wearing utilitarian outfits and wolf masks. People spill out of Chichibunomiya pretty quickly after matches. Many people head straight for a train station, while others walk to the area around Shibuya station (about 20 minutes away) where there are countless pubs, restaurants, and izakaya to choose from. Just a couple doors down from the Canterbury shop is a British Pub decked out with rugby photos and paraphernalia. While not huge it is a fun place to have a drink after the game, meet other rugby enthusiasts, and watch other Super Rugby matches that are kicking off later in the day. Only half the pub is non-smoking and there is nothing separating either section. 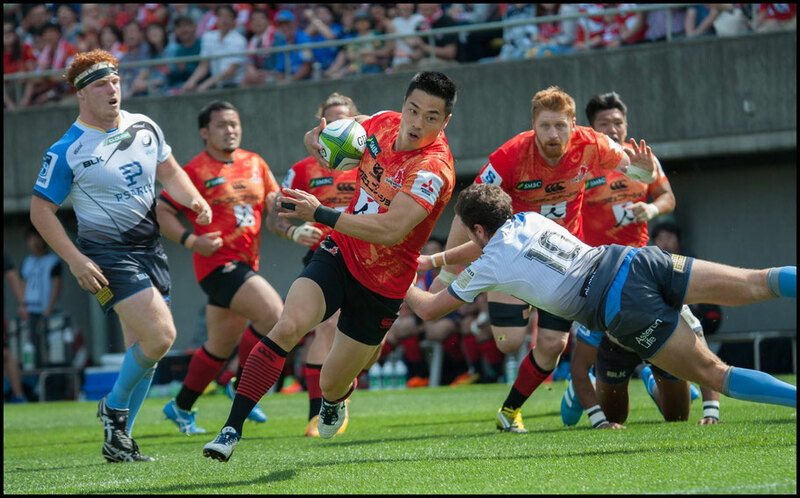 There are many ways to purchase Sunwolves tickets online. 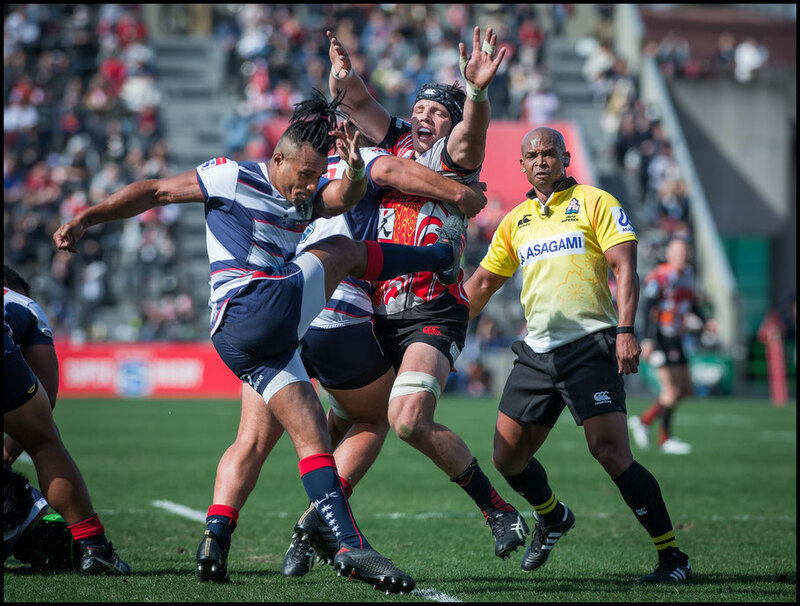 The team’s official website suggests English speakers use E-Tix (http://www.e-tix.jp/super-japanrugby/en/), but it is also possible to use other services in Japanese with a moderate amount of reading ability. Most of the online ticket services allow you to print off the tickets yourself or show them on your smartphone. If you run into issues with using your credit card or do not have one, it is possible to select tickets and then pay for them at a convenience store. The standard procedure is that you show a barcode that was emailed to you, pay, and they print them for you. As is common practice in Japan, some tickets come with merchandise, which is generally factored into the cost of the seat. In previous years fans received seat cushions, towels and flags. This year some tickets come with a special “Smug Faces” jersey. The jersey will have the game details printed on it as well as different player's faces for each match. You can also buy group tickets labeled as either “family zone discount”, which come with one rugby ball per family, or “group zone discount” which include one beer per ticket holder.